Today in Masonic History Paul Revere was born in 1734. 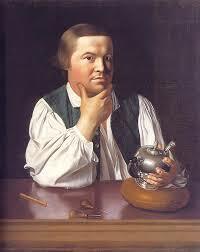 Paul Revere was an American silversmith, merchant and patriot in the American Revolution. Revere was born in the North End of Boston. Revere left school at 13 to apprentice with his father, a silversmith. In 1754 Revere's father passed away and Revere was to young to become the master of the family silver shop. In 1756 he enlisted in the provincial Army to serve during the 7 years war, known in the America's as the French Indian War. His time in the Army was very short and by 1757 he was back in Boston and was married to Sarah Orne. In 1765 the economy in the colony's was not good and was made worse by the Stamp Act. This caused Revere's business to falter and for a brief time Revere took up dentistry. Also in 1765 the Sons of Liberty formed and coincidently met at the Green Dragon, the same meeting place as St. Andrews Lodge. Frustration over a variety of policies coming from England and King George III had Revere making a variety of engravings about the events that were occurring in the Massachusetts at the time including the Boston Massacre and a bowl commemorating the Massachusetts assembly's refusal to retract the Massachusetts Circular Letter. The Massachusetts Circular Letter called for colonial action against the Townsend Acts. In 1773 Revere along with several of Sons of Liberty companions boarded the merchant ship Dartmouth, dumping the tea in it's hold into Boston Harbor. The event now known as the Boston Tea Party was further protest to the Acts of King George III and England. In 1774 a year before his famous ride, Revere rode to Portsmouth New Hampshire on rumors that the British would be landing troops there. The Portsmouth Alarm as it is now called turned out to be a false alarm, it did inspire a rebel assault on Fort William and Mary where gun powder supplies were seized from the 6 British soldiers that guarded the fort. On April 18 1775 Revere's famous ride took place. Riding from Charlestown to Lexington Revere avoided British patrols until being stopped just short of Lexington by a British roadblock. Held captive with other patriots Revere used every opportunity to warn the British soldiers not to continue on to Lexington. Eventually Revere and the other captives were able to scare off the soldiers who released them and returned back to the main British unit. Revere was able to help John Hancock, one of the leaders of the revolution, and his family escape from Lexington. During the American revolution, Revere was a military leader and participated in many battles and events of the war, some positive and some utter failures like the Penobscot disaster. Revere was a member of St. Andrews Lodge in Boston and was the Grand Master of Masons in Massachusetts from 1794 to 1797.